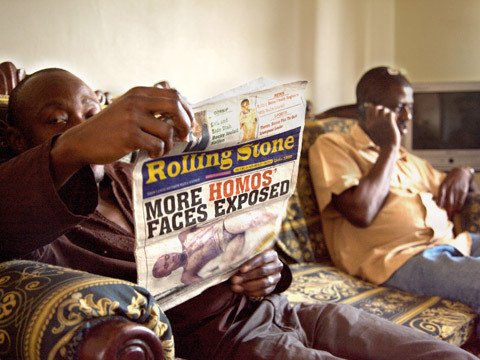 In an unmarked office at the end of a dirt track, veteran activist David Kato labors to repeal Uganda’s homophobic laws and liberate his fellow lesbian, gay, bisexual and transgender men and women, or “kuchus.” A new “Anti-Homosexuality Bill” proposes death for HIV-positive gay men, and prison for anyone who fails to turn in a known homosexual. Inspired by American evangelicals who have christened Uganda ground zero in their war on the “homosexual agenda,” the bill awaits debate in Uganda’s Parliament. Meanwhile, local newspapers have begun outing kuchus with vicious fervor under headlines such as: “HOMO TERROR! We Name and Shame Top Gays in the City.” David is one of the few who dare to publicly protest state-sanctioned homophobia. He fights Uganda’s government and tabloids in the courts, on television, and at the UN. But one year into filming Call Me Kuchu and just three weeks after a landmark legal victory, on January 26th, 2011, the unthinkable happens: David is brutally murdered in his home. His death sends shockwaves around the world, and leaves Kampala’s kuchus traumatized and seeking answers for a way forward. Katherine Fairfax Wright graduated from Columbia University with a double major in film studies and anthropology. She produced Gabi On the Roof In July. Wright has worked closely with Bent-Jorgen Perlmutt, Nelson Walker III, and Fellipe Barbosa. She associate-produced Perlmutt and Walker’s award-winning documentary Lumo, which aired on P.O.V. and won the 2007 Student Academy Award, as well as Perlmutt’s Les Vulnerables. She is a Chaz & Roger Ebert Directing Fellow, and an alumnus of the Film Independent Documentary Lab and the Garrett Scott Documentary Development Grant at Full Frame Documentary Film Festival. Malika Zouhali-Worrall’s work as a print and video journalist has been published in The Financial Times and at CNN.com. She has reported for CNN.com from India, Uganda, China and the U.S. on politics, technology and LGBT rights. Zouhali-Worrall is a graduate of Cambridge University and holds an MA in international affairs from the Paris Institute of Political Studies. She is also a Chaz & Roger Ebert Directing Fellow, and an alumnus of the Film Independent Documentary Lab and the Garrett Scott Documentary Development Grant at Full Frame Documentary Film Festival.